We’ve found yet another excuse to dig into chocolate this winter with the global celebration of World Chocolate Day. In case Christmas, Easter and Valentine’s Day weren’t enough to satisfy your sweet tooth, as a society we’ve decided that chocolate needs a day of its own. Trying to achieve your health and wellness goals but don’t want to get carried away? 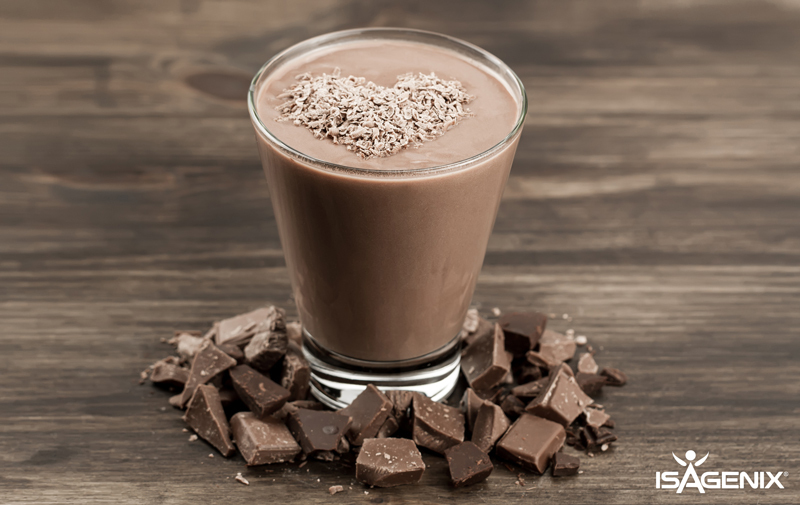 Fortunately, Isagenix® has your back with some tips and tricks on how to combat the almost irresistible chocolate temptations. First and foremost, people may choose to sacrifice essential nutrients to limit their calorie consumption as they pursue rapid weight loss goals. While managing your calorie intake is an essential component in a diet, it’s equally important that you have enough nutrients to ensure that your body can continue its normal functions. How does this influence your food cravings? Well, if you’re undereating, you’ll always be on the lookout for impulse food which, on Saturday, will most definitely be chocolate! The mind over matter mentality is often linked with our training methods, but why not apply the concept to your food choices? Unlike hunger, cravings tend to disappear or drop off when they’re ignored. When chocolate is tempting you this weekend, find a distraction or focus on something other than the sugary sweet that’s staring into your soul. Think back to your first long walk, run or gym session, everything is tough the first time around and there’s no disputing that things do get a whole lot more manageable over time. World Chocolate Day could be the toughest test of them all, but finding a way through could benefit you in the long run. We’re all products of our surroundings, and for that reason, it’s important to create a healthy environment for yourself. They say failing to plan is planning to fail, so it’s vital that you eliminate the uncertainty that leads to impulse eating. Sticking to a shopping list and meal prepping may be tedious tasks; however, they could go a long way in helping you manage your healthy lifestyle or weight-loss journey. We all make mistakes, give in to temptations and follow the crowd on the odd occasion. In this instance, it all comes down to limiting the damage by finding the best possible alternative. Luckily, Isagenix has a range of delicious chocolate products to rival any sweet treat! Want a guilt-free option for when you’re in need of a quick fix? IsaDelight™ chocolates are your go to! With three scrumptious flavours on offer, only 60 calories per square and less than four grams of fat, they’re the perfect sweet-treat alternative After something a little more substantial? Why not reach for an IsaLean™ Bar? Available in five delicious flavours, three of which are perfect for chocolate lovers you can keep your eyes on the prize and enjoy a healthy, sweet treat anytime of the day!